CHICAGO (AP) — Officials gathered to present Catholic nun and celebrated Loyola-Chicago basketball chaplain Sister Jean Dolores Schmidt with Illinois’ 2018 Senior Hall of Fame award. WLS-TV reports Illinois Gov. Bruce Rauner helped present the award Friday to the 99-year-old Schmidt for her work to expand higher education opportunities for immigrant students. She’s also involved in a program that pairs students with members of a nearby retirement community. 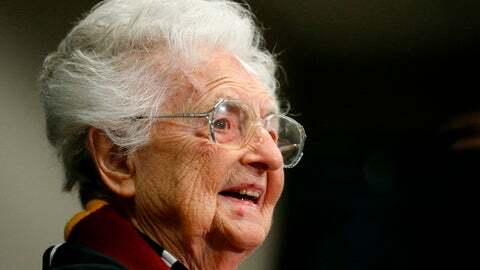 Schmidt won the hearts of many as she cheered on the Ramblers during the NCAA tournamen t. The National Bobblehead Hall of Fame and Museum, in conjunction with Loyola, even produced a limited edition Sister Jean bobblehead. State Sen. John Cullerton, who nominated Schmidt for the award, says she’s been a goodwill ambassador for the school, the city of Chicago and the state.